Give clients a product that matches their occupation and unique needs at the right price. They'll pay for only what they want and need. And when your clients have a claim, we'll be here to help. The Family Care Benefit helps clients take time away from work to care for a family member with a serious health condition.1 This benefit, exclusive to The Standard, provides a monthly benefit if an employee works at least 20 percent fewer hours and has an income loss of 20 percent or greater. Provide your clients a benefit if they are residually disabled, rather than totally disabled, based on loss of income, duties and/or time. Platinum Advantage comes with three residual disability benefit options: Enhanced, Basic and Short-Term. Offer coverage for highly specialized professionals who become disabled and are unable to perform the substantial and material duties of their regular occupation, even if they can work in another occupation for wage or profit. With the Noncancelable Policy Rider,2 premiums and policy provisions will be locked in for the duration of the policy. We won't cancel the policy, raise premium rates or reduce coverage as long as the premiums are paid on time. 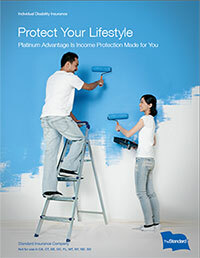 Platinum Advantage income protection insurance includes our exclusive Family Care Benefit. Listen to real people talk about how they’d welcome the help if they had to care for a seriously sick or injured family member. Interested in reaching more customers? We've designed a versatile income protection product that works for a wide range of individuals. Contact your General Agent to learn more about Platinum Advantage. 1 The Family Care Benefit is not available in Connecticut or New York. Family members include a client's spouse or domestic partner, parents and children (including adopted children, stepchildren and children of the client's domestic partner). 2 Noncancelable policy provisions are incorporated into the base policy in Florida. 3 Not available in Connecticut or New York. 4 In Florida, during the first 12 months of disability, your client may be working in another occupation and still be considered totally disabled. 5 Not available in Connecticut.